The neighbourhood was named after the death of an old woman who's nickname was Mai Ichhra of now Muslim Kamboja tribe who migrated from Mesopotamia/Mittani having worshipped in ancient times their mother goddess Ishara, Bull (mythology), Kamadhenu and Lahar (god). 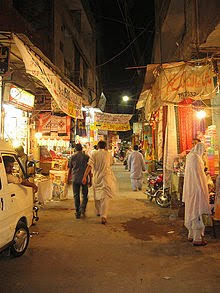 Some historians believe that Ichhra is older than Lahore(city named after Lahar (god) and the presence of Lahori gate supports this claim as this gate is towards Ichhra. Lahri a sub-clan of ancient Kamboja is residing in Lahore, Pakistan and Afghanistan. These Kamboja people claims to be offsprings of Semetic/Mahabharata Kamboja and Iranian Cambyses. They also claim to be Shami People originating from Shem and related to Italian Italian Campania and Asian Cambodia. Samanabad was the name of this whole locality of these Kamboja Shamans whereas Ichhra was the name of Ishara Devi temple whose ruins still exist in proper Ichhra market. Now Samanabad and Ichhara are used alternately.